Those in the finance sector who buy foreign currencies on the expectation that the lira will fall will pay "a very heavy price," independent news site T24 reported Turkish President Recep Tayyip Erdoğan as saying on Sunday. The Turkish president, without specifying who his comments were aimed at, noted that country’s Ministry of Finance had rolled up its sleeves to this end, T24 said. The threat from Turkey’s strongman arrives as the country’s currency tumbled more than 4 percent against the U.S. dollar on Friday, the greatest one-day fall since the financial crisis, which erupted in August of last year, which resulted in the country’s currency losing up to 40 percent of its value. The country’s Central Bank data on Thursday showed that forex deposits and funds including precious metals held by Turkish locals had hit a record high in the week to March 15, in a move interpreted by economists as a sign in the fall in confidence in the lira. 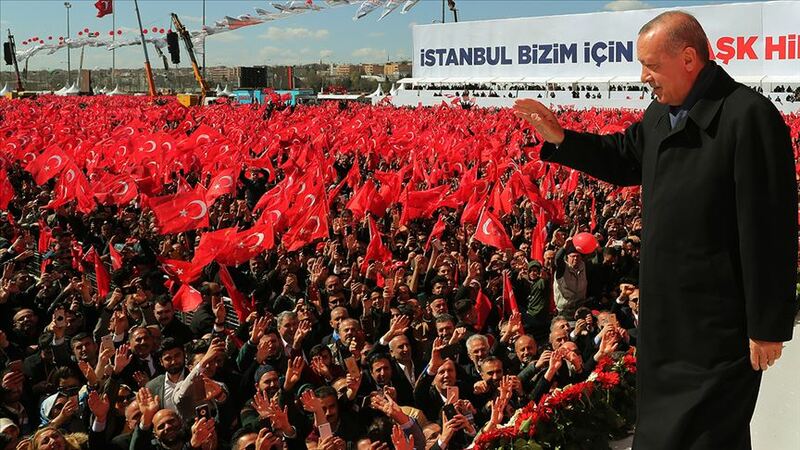 "Some people" had begun provoking Turkey and that they were attempting to make the lira decline against foreign currencies with their cooperators in Turkey, Erdoğan said during an election rally for the March 31 local elections in İstanbul. "I am calling on those who engage in such activities on the eve of elections, we know all of your identities. We know what all of you are doing. Know this, after the elections, we will present you with a heavy bill," the Turkish president said. On March 31st, Turks will head to the ballot box to vote in local elections, choosing mayors and neighbourhood leaders throughout the country. Turkey's banking watchdog, the Banking Regulation and Supervision Agency (BDDK) on Saturday announced it had launched investigations into complaints that a JP Morgan report had caused speculation in the Istanbul stock market, hurting the reputation of banks and causing volatility in financial markets. Said report noted that a high risk that the lira would decline after the local election, recommending clients to go "long" on the U.S. dollar, in advice that is typical of client notes from banks globally, according to Reuters. The country’s Finance Minister and Erdoğan’s son-in-law Berat Albayrak on Friday accused speculators of talking down the Turkish economy on social media, calling it a ‘’manipulation’’ similar to the anti-government protests in 2013 known as the Gezi Park protests. "Ey katiller, gelin de görelim; gelin de dedeleriniz gibi sizi aynen yerin dibine indirelim"